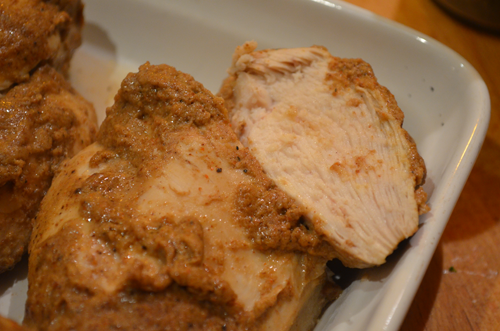 Spice Marinated Skinless Chicken Breast | eat. live. paleo. Tender AND flavorful lean chicken breast? It’s possible! With chicken, I definitely prefer thigh meat to breast meat. Thigh meat has so much more flavor and, of course, more tasty fat. And who doesn’t love crispy chicken skin? Unfortunately for me, thigh meat and chicken skin also contain more Omega-6 fats, the kind of fat David and I are trying to decrease in our diet (while upping our intake of Omega-3 good fats). So I recently experimented with baking skinless chicken breasts as a source of protein “snack” we can have in our fridge. My idea was the have cooked chicken breasts available in our fridge, which we can slice up and eat on top of a salad or just as they are when we wanted some protein boost. It seemed like a good “make ahead” and “keep” in our fridge. After making the Indian-spiced curry, I have been experimenting more with spices, especially garam masala. 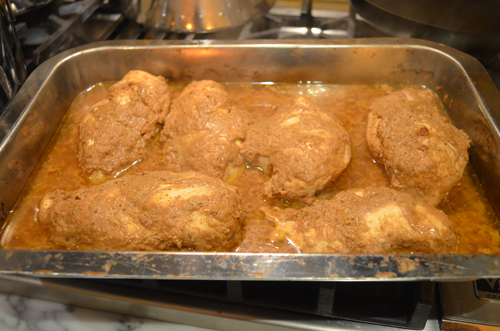 To make chicken breasts interesting flavor-wise and also tender, I knew that I had to marinate them overnight. I combined a variety of spices, and also added balsamic vinegar as well as lemon juice, to help tenderize the meat. The result? The breast meat was so tender and so flavorful, even a chicken thigh lover like me was satisfied. David loves having these chicken breasts in the fridge, because it’s so easy for him to put together a lunch (just add salad and avocado). If you are looking for some tasty lean meat to have on hand in your fridge, I highly recommend cooking up some skinless organic chicken breasts! In a large bowl, combine all the ingredients for the marinade, whisk together. 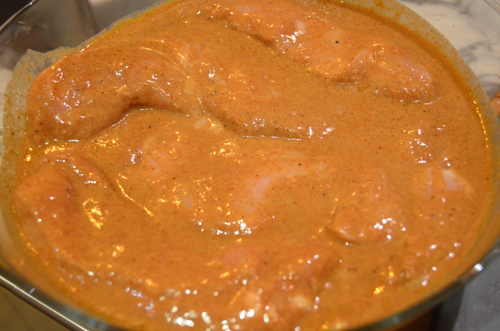 Add the chicken breasts to the marinade, making sure each piece is generously coated. Cover tightly with cling wrap and marinate overnight. 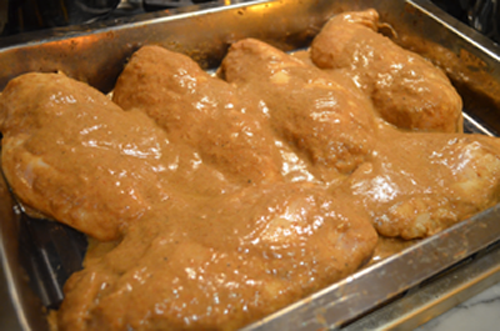 **It is important to marinate at least overnight, so that the meat will tenderize and take on the spice flavors. Transfer the chicken breasts onto a roasting pan, in a single layer. 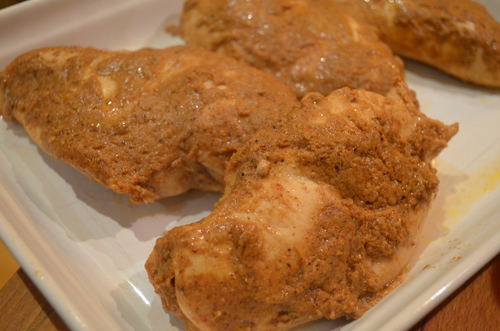 Pour the remaining marinade over the chicken breasts. Tightly cover the roasting pan with aluminum foil. Place the pan in the oven and cook for around 35 minutes, or until the chicken breasts are cooked (I take one out and cut it to make sure). Remove the pan from the oven, uncover. Remove the chicken breasts from the pan and onto a platter. Let the meat rest for at least 5 minutes. I like to store the chicken breasts in an air-tight tupperware. They will keep for a few days. Enjoy!